The black holes have arrived! A ball bearing illustrating the Schwartzchild radius of the Earth. 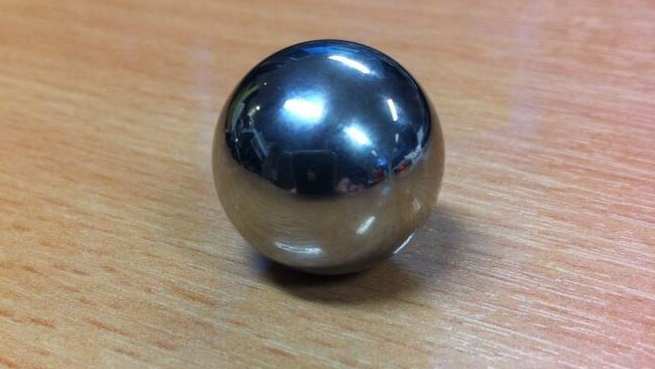 I’ve ordered a handful of 18mm steel ball bearings for a demo that isn’t a demo, it’s merely a handling object, but handling objects can also have power and impact. Hold out your hand and feel the weight of this ball on your palm. It’s pretty heavy. The metal is dense. Now imagine the impossible. Imagine that all of this room is squashed and squeezed into the ball. It’s pretty tightly packed and much more dense. Now imagine the whole building is inside this ball. Hardly conceivable, but we’re not there yet. The stuff we’re made of contains lots of gaps – tiny gaps we can’t see, but gaps nonetheless. If all those gaps were filled in with more stuff we could squeeze even more mass into the ball. The whole city. The country. The entire world. If the whole Earth, everything in it and everyone on it, were so densely packed that it could fit inside this steel ball, it would be a black hole. So dense that nothing could escape the pull of gravity. It’s incredible how powerful something can be when brought down to an intimate, handle-able size. The Earth has a Schwartzchild radius of 9mm. If the Earth was a black hole it would comfortably fit inside my wedding ring. That’s amazing. Footnote: Please make sure you read Dave Ansell’s comment below. We’re not aware that any black holes the mass of the Earth exist. Black holes with larger mass would not need to be so dense.